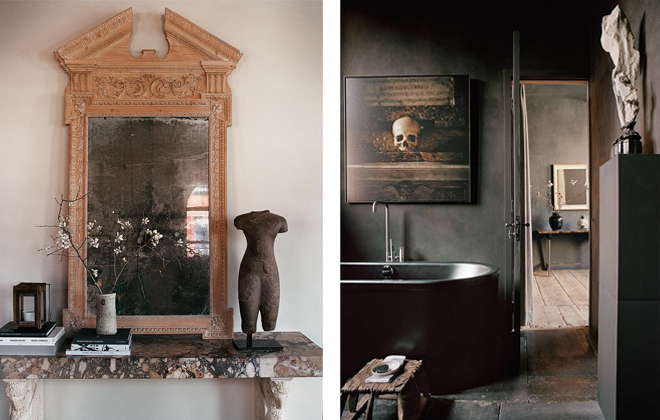 I have long lusted after the beautiful interiors by the husband and wife duo behind Atelier AM. With rich influences spanning from old world European style, to contemporary West Coast comfort, they create spaces that are filled with warmth and feeling, yet are light, airy, and totally livable. Based in LA, Alexandra and Michael Misczynski make it a point to incorporate world travel into their practice, with a piet-a-terre in Soho, and frequent trips to Europe to meet with clients and source fabrics and textiles. This is part of what keeps their style so fresh and hard to classify, incorporating reclaimed wood floors, and 19th century Italian marble consoles. I find the results breathtaking! Left: 19th century carved pine mirror and Italian marble console ; Right: I just love the color of the master bath in AM’s Soho loft. The duo also comes at each project from their respective backgrounds in architecture and interior design. Michael, an LA-native who studied architecture at USC under designer Rose Tarlow, went on to work for the iconic Richard Meier in New York. Alexandra on the other hand grew up in and around New York City, under the influence of her mother’s British-classic style, before going on to make her way in the world of interiors, working for giants like the late Naomi Leff. Bringing together his architectural prowess and her eye for textiles, they are able to create these grand, but “edited” styles for the home. 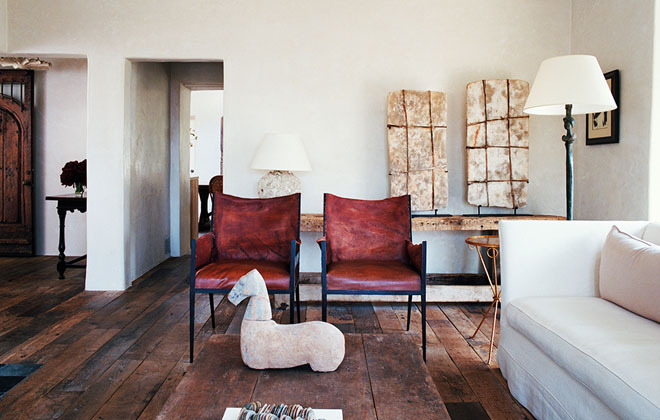 This often comes in the form of choosing lush old antiques for open, even austere spaces, which is present throughout all of their varied projects, from an apartment on Park Avenue, an “art barn” in Aspen, to a Sun Valley retreat. Their own homes in LA and New York, which were shot by photographer Francois Halard for their 2012 Rizzoli monograph “Interiors | Atelier AM,” are probably my favorite of their projects, as they features beautiful key pieces like a 1925 Jean Michael screen, while still embracing the open airy plan of the traditional Soho loft, or laid back LA-vibe. 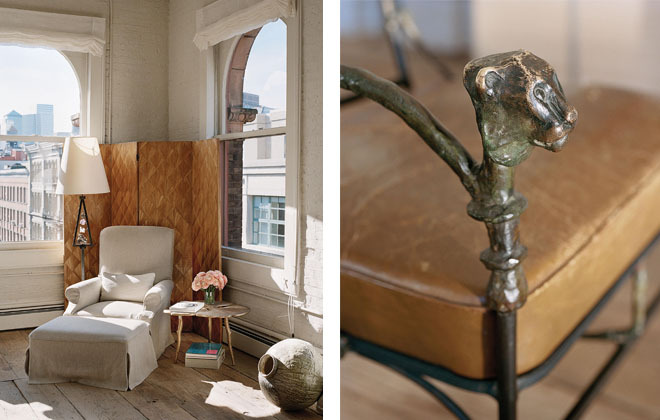 Right: A sunny corner in AM’s Soho loft, with Jean Michel screen; Right: detail of an antique Giacometti cast chair. In the almost 15 years they’ve had the firm together, Alexandra and Michael have garnered an impressive list of clients, from Hollywood elites, to philanthropists, and art collectors. “We set out to build an elegant, yet homey-and-cozy California indoor/outdoor home,” Alexandra told WSJ of one high profile project they did for Paramount Pictures executive Brad Grey, which sums up what’s so perfect about their approach. They create homes to be lived in, but also fawned over! I am a total fan. The couple’s open, airy Soho Loft.